Team Sask has had a busy last few days! Parents night was held on Thursday night and the parents met and mingled with curling parents from across Canada. 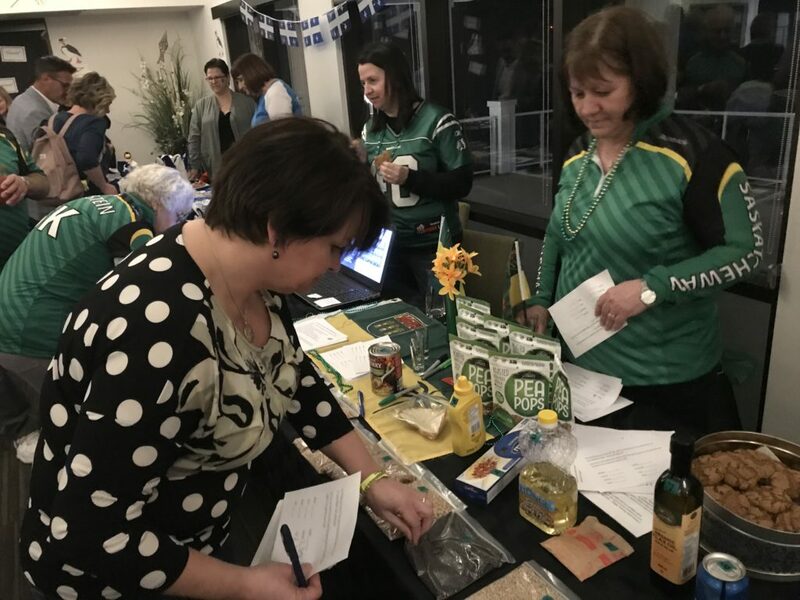 At the Saskatchewan table we hosted a “Grain Game” in which you had to identify samples of different crops grown in Saskatchewan and match it up with a finished food product. It was harder than it looked and for the winners we gave Three Farmers Dill Pickle Pow Pea Pops as prizes! The boys have been busy curling, two final round robin games on Friday and they advanced to the championship round with a 3-3 record! They had two close playoff games on Saturday, the first against British Columbia and the second against Nova Scotia, but we came up short in both. Our curling is now done for the week, but the team will stay to watch and cheer at the final games. Our lead, Ethan Nygaard, was awarded the Men’s Pool B Sportsmanship Award, congratulations Ethan! Our week wraps up with a Victory Party tonight for the teams. It’s been an amazing week, with great curling, fantastic ice & facilities, super fans and wonderful volunteers! Thank you to the Host committee, ice technicians, umpires, volunteers, the Sherwood Park Curling Club and Curling Canada for a memorable week!